The highly efficient automatic transaxle has 5 forward speeds and one reverse speed. The individual speeds are selected automatically, depending on the position of the shift lever. 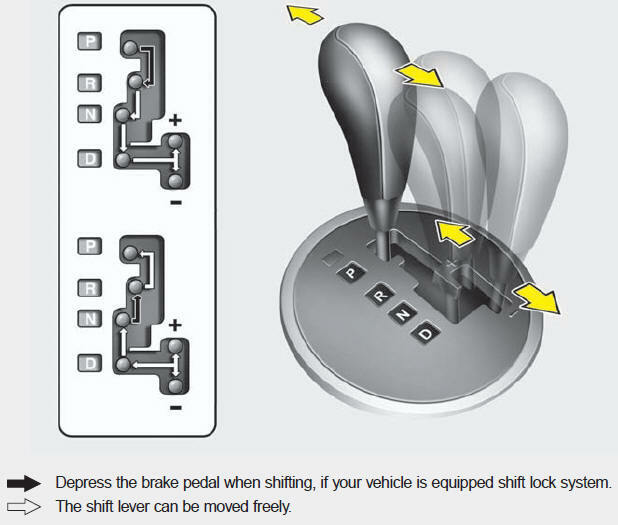 To move the shift lever from the P (Park) position, the brake pedal must be depressed with the ignition switch ON. • Always check the surrounding areas near your vehicle for people, especially children, before putting a car into D (Drive) or R (Reverse). • When stopped on an upgrade, do not hold the vehicle stationary with engine power. Use the service brake or the parking brake. • Do not use the P (Park) position in place of the parking brake. Always make sure the shift lever is latched in the P (Park) position and set the parking brake fully. • Before leaving the driver’s seat, always make sure the shift lever is in the P (Park) position. Set the parking brake fully, shut the engine off and take the key with you. Unexpected and sudden vehicle movement can occur if you do not follow these precautions in the order specified. The wheels and transaxle are not locked. The vehicle will roll freely even on the slightest incline unless the parking brake or service brakes are applied. This is the normal forward driving position. The transaxle will automatically shift through a 5-gear sequence, providing the best fuel economy and power. Bring the car to a complete stop before shifting the selector to “D” position. In sport mode, it is possible to shift the gear by using either the shift lever or the steering wheel shift paddles (dynamic shift). 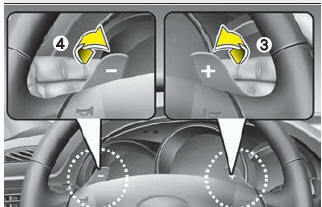 Up (+) : Push the lever forward once to shift up one gear (1). Down (-) : Pull the lever backwards once to shift down one gear (2). Up (+) : Pull the right-hand shift paddle once to shift up one gear (3). Down (-) : Pull the left-hand shift paddle once to shift down one gear (4). When the shift lever is in the P, N or R position, you can't shift the gear by using the steering wheel shift paddles. 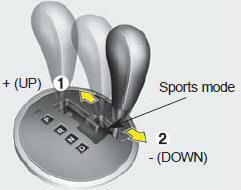 In sports mode, if you pull the left and right hand shift paddles at the same time, you can't shift the gear. • In sports mode, only the 5 forward gears can be selected. 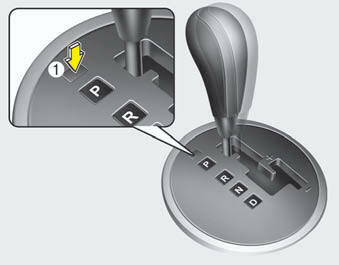 To reverse or park the vehicle, move the shift lever to the R (Reverse) or P (Park) position as required. • In sports mode, downshifts are made automatically when the vehicle slows down. When the vehicle stops, 1st gear is automatically selected. • In sports mode, when the engine rpm approaches the red zone shift points are varied to upshift automatically. • To maintain the required levels of vehicle performance and safety, the system may not execute certain gearshifts when the shift lever is operated. • When driving on a slippery road, push the shift lever forward into the +(up) position or pull the right-hand shift paddle. This causes the transmission to shift into the 2nd gear which is better for smooth driving on a slippery road. Push the shift lever to the - (down) side or pull the left-hand shift paddle to shift back to the 1st gear. • By rapidly moving the shift lever backwards (-) twice it is possible to skip one gear, i.e., 3rd to 1st, 4th to 2nd or 5th to 3rd. Since sudden engine braking and/or rapid acceleration can cause a loss of traction, however, downshifts must be made carefully in accordance with the vehicle's speed. To shift the transaxle out of P (Park): 1. Depress and hold the brake pedal. If the brake pedal is repeatedly depressed and released with the shift lever in the P (Park) position, a chattering noise near the shift lever may be heard. If the shift lever cannot be moved from the P (Park) position with the brake pedal depressed, continue depressing the brake, then do the following: 1. Press the shift-lock release button (1). 3. Have your vehicle inspected by an authorized KIA dealer immediately. • Never move the gear selector lever from P (Park) or N (Neutral) to any other position with the accelerator pedal depressed. • Never move the gear selector lever into P (Park) when the vehicle is in motion. • Do not "ride" the brakes. This can cause them to overheat and malfunction.